From the national stadium in Oslo to a windswept but beautiful pitch in the Arctic circle, here are the best football stadiums in Norway. Groundhopping is a popular hobby among football fans. Some in the UK try to join the '92 Club' by visiting all the stadiums used in the Premier League and Football League. Others visit a stadium in a different European country each year. Norwegians join in on the hobby too. One Norwegian football fan interviewed by the BBC has been to over 400 grounds in the UK! 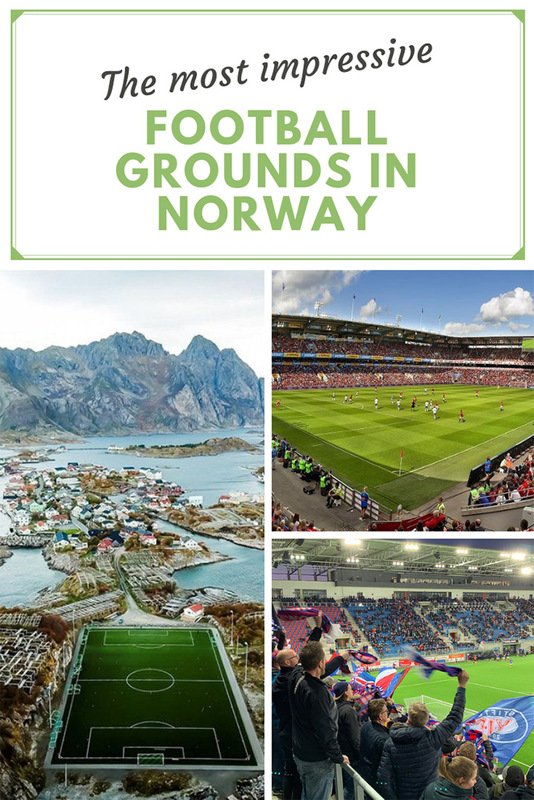 Norway has its fair share of football grounds and it's relatively easy to plan a trip to a football match whether you're in Norway or coming from abroad. But the interesting thing about groundhopping in Norway is that many of the most interesting grounds are some of the smallest! Here are some of my favourites. 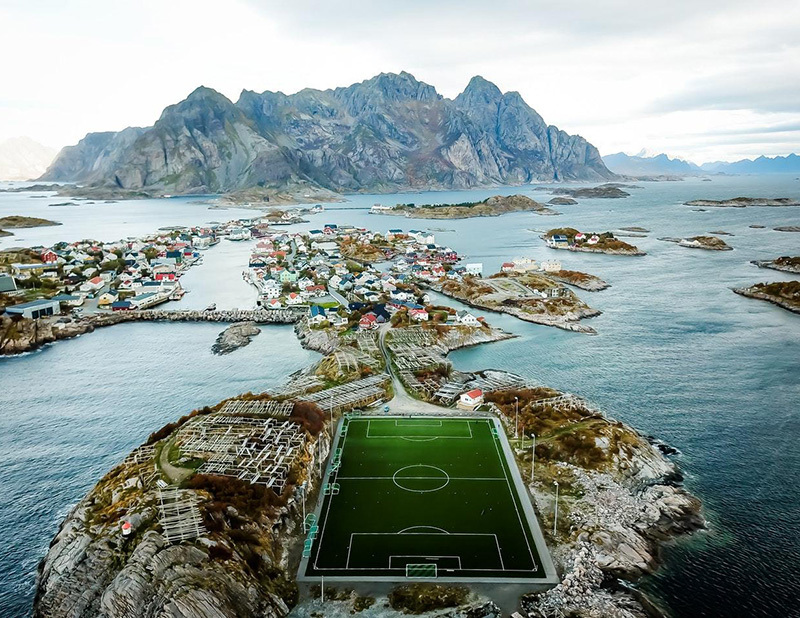 Up on the rocky islands of the Arctic circle, you find space for a football pitch wherever you can. 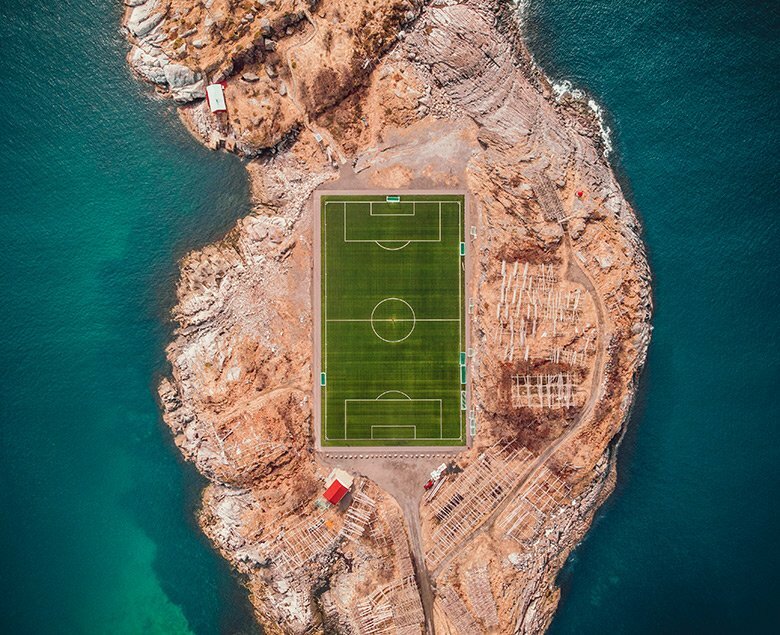 Here in windswept Henningsvær on Norway's famous Lofoten islands, this astonishing pitch was dubbed the world's most beautiful by a UK newspaper. In this aerial view, you can clearly see the fish drying racks that surround the pitch. These are to be found all over the islands. They are used to dry Arctic cod to make stockfish that is exported all over the world. This tiny ground doesn't seat the number of spectators as the country's biggest stadiums. In fact, you'll have to take your own chair if you want to sit down! But the bewildering views surely makes this one of the most incredible grounds at which to play or watch football anywhere in Norway. Perhaps even the world. From one of the smallest grounds to the biggest. The national stadium hosts the home games of the Norwegian men's national football team and the final of the annual Norwegian cup. 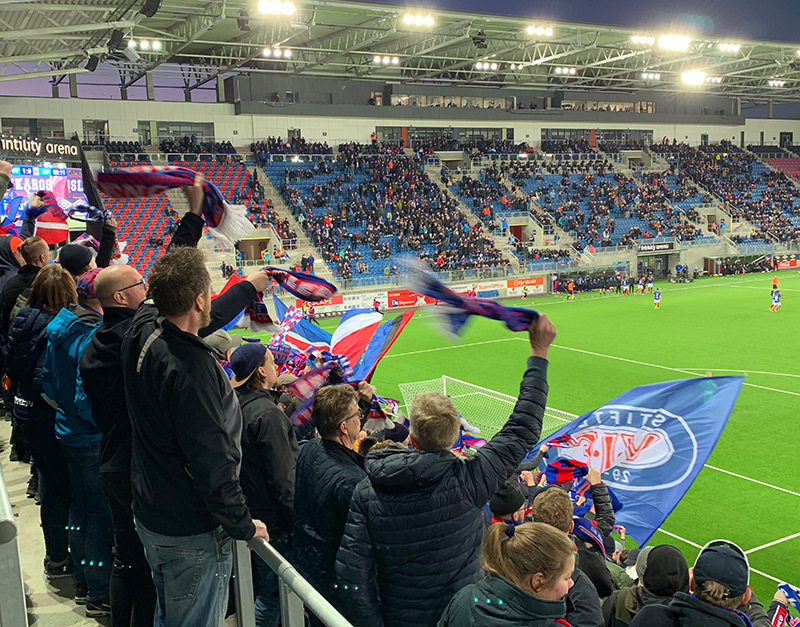 The Ullevaal Stadion also hosted the home games of Vålerenga until the club's recent move to the purpose-built Intility Arena. Open since 1926, the stadium has been upgraded several times and now holds up to 28,000 for football matches. 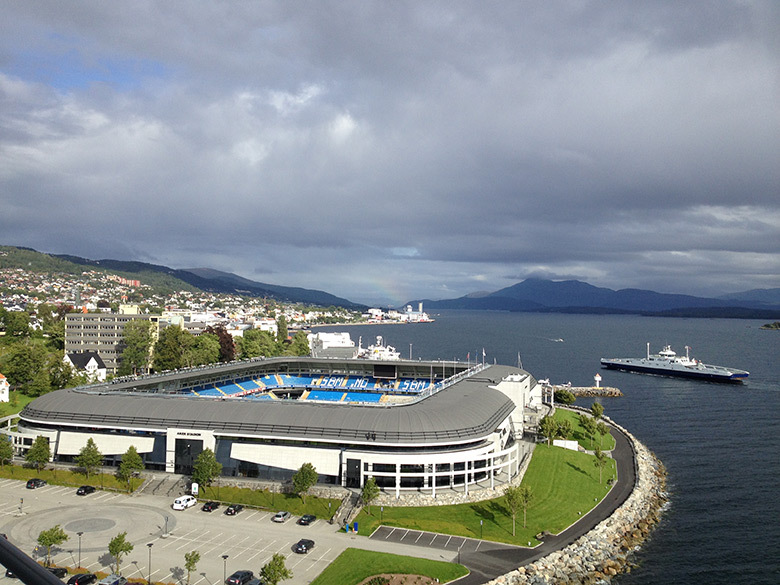 Owned by the Norwegian Football Association, the stadium also stages a handful of major concerts throughout the year. 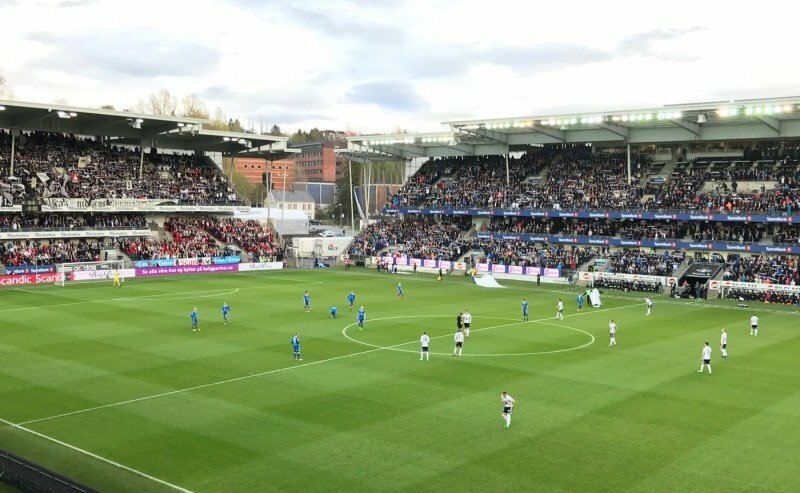 Is it any wonder that the players of Sogndal haven't been able to focus their minds on the job of staying in Norway's Eliteserien when they have beautiful snow-capped mountain landscape all around their stadium? The 5,500-capacity football ground is the centrepiece of the impressive Fosshaugane Campus development, which also includes substantial education and business elements. One of the downsides of visiting the ground is its awkward location, making it difficult to get to easily. Perhaps that's why a few years ago, captains of Eliteserien teams voted it their least favourite ground. However, its location can also be seen as a plus if you plan on combining a visit with a holiday. 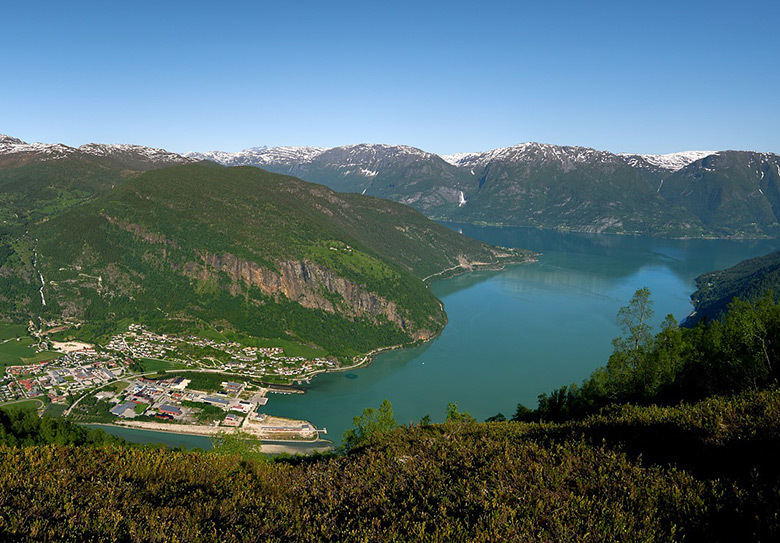 Sogndal is at the very heart of the fjord region, with the epic Sognefjord, glaciers, stave churches and more nearby. 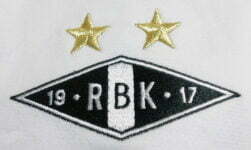 The Lerkendal Stadium is home to the most successful team in Norwegian club football, Rosenborg. Based a mile south of Trondheim city centre, the Lerkendal has the highest average attendance in the domestic game. It's also the biggest club ground, so it's usually possible to get a ticket for most games on the day. The exceptions are usually the 16th May game (the eve of the Norwegian national day) and if and when Rosenborg are closing in on the league title. The Lerkendal also hosts Champions League qualifying and Europa League games. In recent years, the likes of Ajax, Celtic and Lazio have played here. In addition, the stadium hosted the 2016 European Super Cup between Sevilla and Real Madrid. The annual UEFA match is played out between the winners of the past season's Champions League and Europe League. 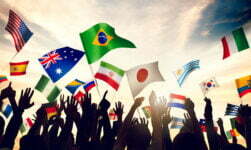 In recent years the showpiece game has been played in some of UEFA's smaller member countries. The large club shop is located within the western end of the stadium, along with a pizza restaurant and the ticketing offices. In 2014, the eye-catching Scandic Lerkendal hotel opened with a panoramic skybar that overlooks the stadium from the 20th floor. The club that interrupted Rosenborg's dominance by winning the league title in 2011, 2012 and 2014 play in this smart stadium by the water's edge. Funded mostly by Norwegian businessman Kjell Inge Røkke, one of Norway's richest people, the all-seater stadium can hold 11,249 spectators. As with Rosenborg's Lerkendal Stadion, a Scandic Hotel towers over the ground. The picture above was taken from one of the rooms, and the one below from the away end clearly shows the hotel. The stadium is within walking distance from the town centre, so there are several other accommodation options. 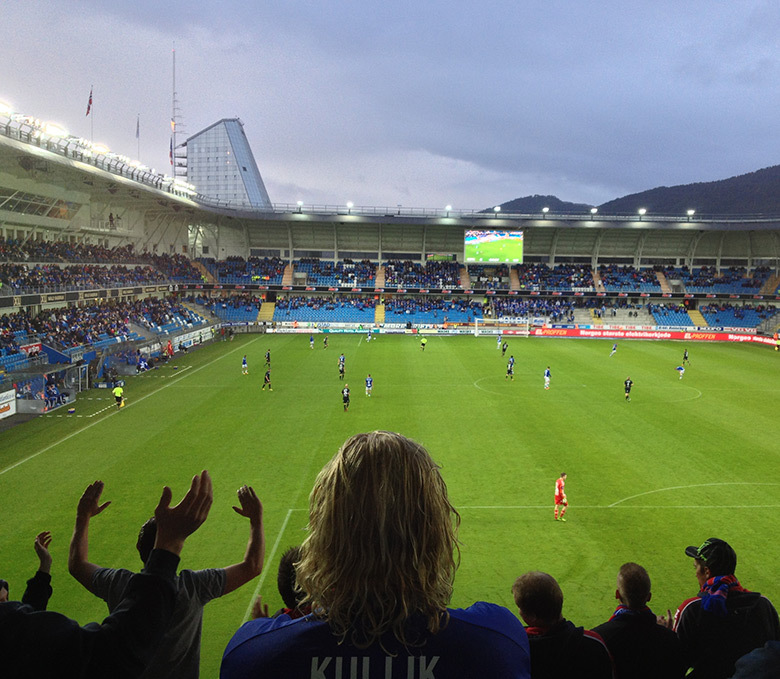 The stadium has hosted two international games (Norway v Saudi Arabia and Norway v Scotland) and several Molde games in the UEFA Champions League and Europe League. The stadium has had artificial turf since 2014. Many visitors combine a trip to Aker Stadion with a trip to one of the many nearby tourist sites. I recommend the nearby Atlantic Road, a trip down to Ålesund, or some hiking in the Åndalsnes region. The newest stadium on my list is Oslo's Intility Arena. Capable of holding up to 16,555 spectators, the stadium is the new home to Oslo's biggest club, Vålerenga. The opening of the arena in 2017 was a landmark day for the club. After decades of playing at temporary homes, they were finally able to play a home game in east Oslo, their traditional home. A new ice hockey stadium is also being constructed at the site for Vålerenga's top tier team. The planning of the stadium wasn't without its political controversy, with many people against the council selling the land to the club for a symbolic one krone. The club paid for the stadium, at a total cost of around 760 million kroner. One of the intriguing features of the arena is the incorporation of a brand new school, one of the conditions of the stadium being built. The city council has entered into a 25-year-lease with the club for the school. The stand behind one of the goals (pictured above) is entirely safe standing, along with one-third of the stand at the other end, which is where away fans are situated. Seats are locked for Norwegian games but can be put into place for European games that require all-seater stadiums. 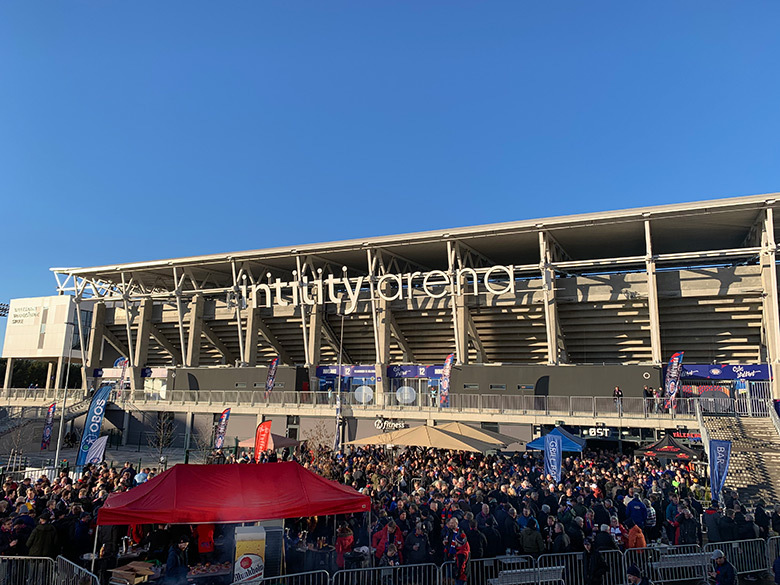 With direct flights from all over Europe to Oslo, the Intility Arena is one of the easiest stadiums for international football fans to visit. The last stadium isn't on the list for its aesthetics. Depending on the league standings all over the world, Tromsø's Alfheim Stadion is often ranked as the northernmost top flight stadium in the world. Coming here for a match can be quite the experience, especially at the beginning or the end of the season. At these times, snowfall is common and the pitch often has to be cleared by volunteers for the game to go ahead. 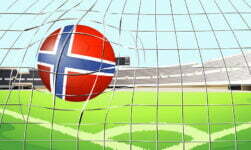 Football fans of a certain age are sure to remember one of Tromsø's most famous ever victories. In October 1997, Chelsea came to town for a UEFA Cup match. The English side were beaten 3-2 as a blizzard raged across the Alfheim during the second half. Other Eliteserien stadiums in easy to reach places include Bergen's Brann Stadion, Stavanger's Viking Stadion, and Lillestrom's Åråsen Stadion. The latter is close to Oslo Airport. 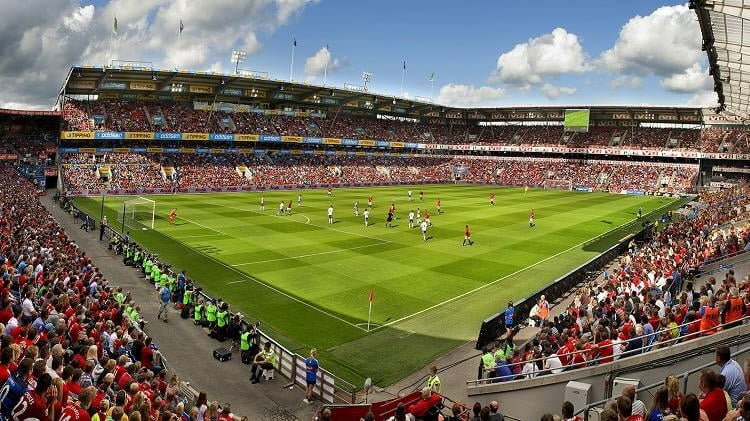 What is your favourite football ground in Norway?